Your taste buds are about to go on an exciting journey! Here’s a fun summer dish to get your taste buds super excited! My fried halloumi cheese burger. I know a lot of people go ga-ga over halloumi cheese. And I can understand why. To help with those cravings, I’ve featured it in many different ways here at Souvlaki For The Soul. I’ve mixed it with quinoa to make “keftedes“. I’ve given it a Mexican makeover with tacos and quesadillas. The possibilities are endless and it’s one of my favourite cheeses to experiment with. This is my second recipe for Dodoni. I’m using their Dodoni halloumi as my inspiration. I like throwing casual get togethers with friends – especially in the summer. It’s all about quick and easy recipes while watching the sun set in the distance. (preferably with a cool drink as well!). The halloumi is definitely the star in this dish. It doesn’t play second fiddle. It’s crumbed and fried gently in some olive oil. It involves a minimal amount of frying. But this is the good kind of frying. You add some some crispy cabbage, fresh tomatoes and a good bun… and (to quote my nieces) its’ “O.M.G!”. Yes. I stand by that statement. At the last minute I felt that this dish needed just a little bit of extra love. (Sorry. Can’t help myself!). I added a few prawns which were sauteed in butter, garlic and parsley. The final touch was to top it off with a lemon aioli. And just like that the dish became epic! I’m sorry if I’m rambling. I can’t help it. Please make this halloumi cheese burger if you get a chance. Take care and I’ll see you in a few days. This fried halooumi cheese burger will make your mouth water. Served with lettuce and tomato - it's the perfect summer dish. Dip the cut halloumi slices in flour, then dip it ino the eggwash and finally in the breadcrumbs. Ensure your slice in fully coated. Once you crumbed all the slices lay them on a plate lined with baking paper and place them in the fridge for half an hour. Preheat your oven to 80 deg C and line an oven tray with baking paper. Pour the olive oil into a small - medium sized pan. Fry the halloumi on a medium heat two at a time making sure not to overcrowd the pan. Fry them for 3 mins each side until they are golden. 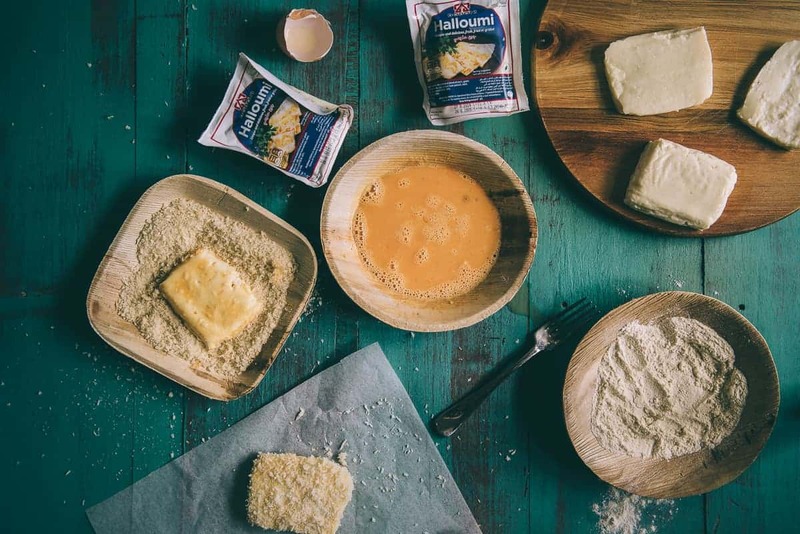 Drain the halloumi on kitchen paper towels and place in the oven to keep warm (this ensures the cheese stays soft). 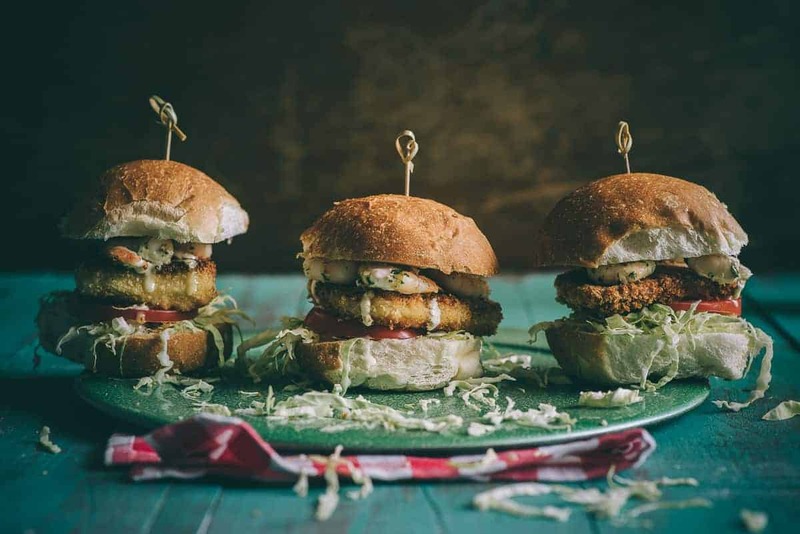 Construct your burger by adding the shredded cabbage, tomatoes, fried halloumi cheese and lemon aioli. You may wish to add a few cooked prawns (shrimp) as an extra to your burger - trus me this is a good move! Souvlaki For The Soul would like to acknowledge its partnership with Dodoni Feta for this sponsored post. The recipe above was created, developed and photographed by Souvlaki For The Soul using Ddodoni Halloumi cheese.